On April 1, 2018, Blairsville Mayor Chester C Davis was summoned to quell a mob of angry Blairsville citizens. The mob, a mixture of black and white men, had surrounded three slave catchers who were attempting to kidnap a former slave named Richard Newman. Davis intervened on behalf of the slave catchers and stopped a probable lynching. Chester Davis was born in Indiana County in 1817 and had resided here with his wife and seven children. Davis was an undertaker, cabinetmaker, and auctioneer and a colorful character! In 1861, Davis gained notoriety in Uniontown when he defended the Union to a “burley mountain man” who claimed he could “lick anyone from Indiana County who supports Lincoln and his unholy war.” Chester Davis reportedly leveled a crushing blow to the man’s neck, bringing him to his knees. 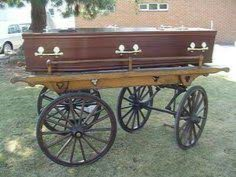 At home, though, the mayor came under attack when he refused to burn his funeral wagon after transporting a victim of small pox.